If you love Ina Garten’s recipes and have even one of her cookbooks, you are going to want to check out the muse for today’s recipe. Lidey Heuck is a recipe tester for the Barefoot Contessa. 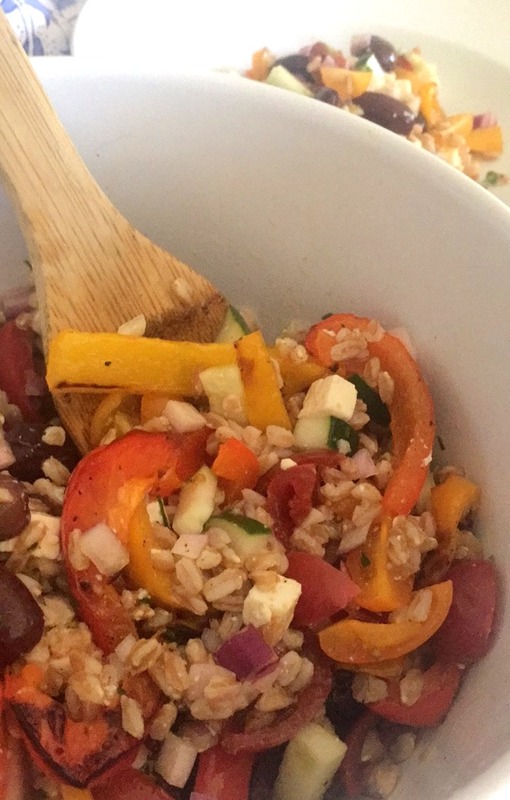 Having her own blog, Lidey’s Table, it was her summer salad which Ina Garten shared on her instagram recently crediting Lidey that enticed me to try it. And it was well worth it. 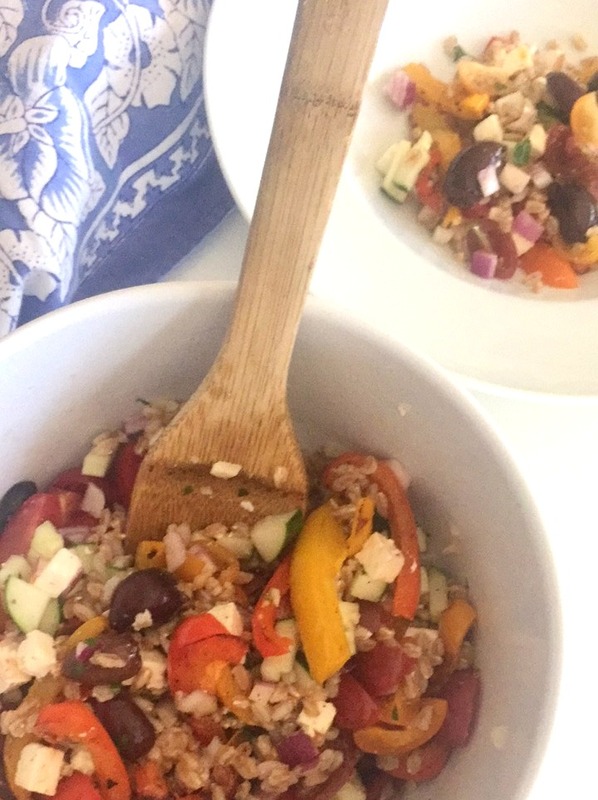 As well, I had just seen Smitten Kitchen’s Mediterranean Pepper Salad, inspired by a Zabar’s recipe, and as you will see, the two are quite similar, so the tweaking began. The magical ingredient is the roasted bell peppers. Like candy. You will seek them out of the salad if it weren’t for the other delicious ingredients. Like the previous farro recipe that was recently shared here on the blog, add a poached egg or slices of grilled chicken and an entire meal is made. It is a delicious salad. Enjoy. Cook the farro: dry toast the grains in a medium saucepan (2-3 minutes), add 3 cups of water, add a pinch of salt and bring to a boil, then low ever the at and simmer for 25-30 minutes until faro is just cooked, drain and pour into a large bowl. While the faro is simmering, making the vinaigrette: whisk the lemon juice, vinegar, garlic, 3 tablespoons olive oil, 1 teaspoon salt and 1/2 teaspoon pepper. After the farro is cooked and drained, pour the vinaigrette over the hot farro and stir well. 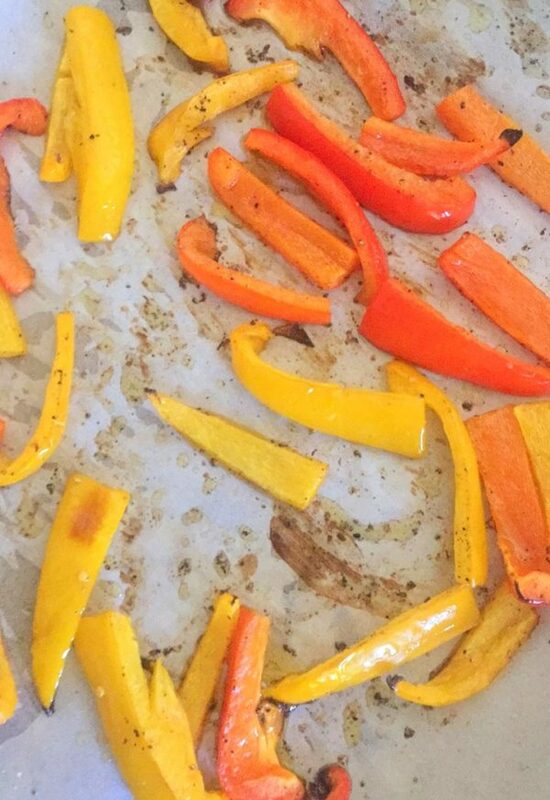 While the farro is cooking and the dressing has been made, place the bell pepper strips on a parchment lined baking sheet. Drizzle with olive oil and sprinkle with salt and pepper, toss to coat and place in the oven for 20 minted (toss at 10 to ensure even roasting). Set aside the roasted peppers to cool. While the peppers are cooling, dice the remaining salad ingredients. 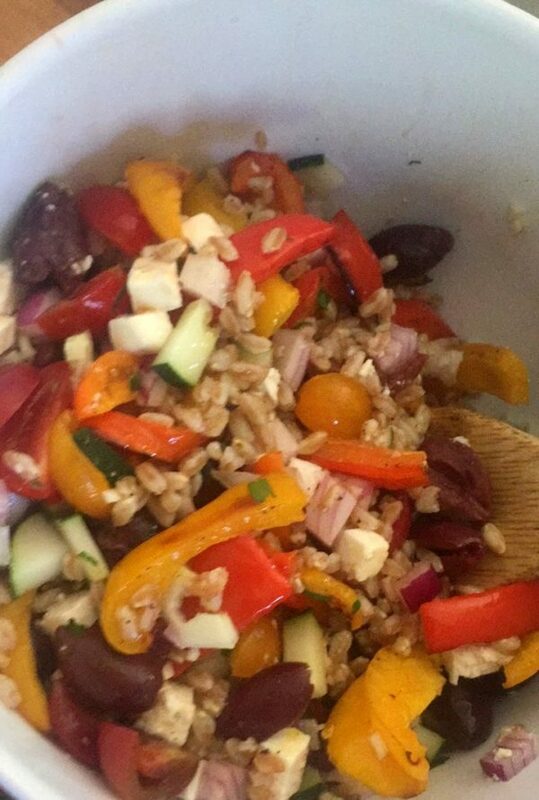 Add the roasted peppers and salad ingredients to the dressed farro. Toss to coat. Serve warm or cold.